Meet Josephine-Kathryn Smith, better known as Cinderella Smith due to her habit of continually loosing at least one shoe everywhere she goes. She’s funny, she’s quirky, and you’re going to love her. She’s a Bridget Jones for the grade school crowd. Actually, I can’t back that up. You see, Esteemed Reader, Cinderella Smith is a girl book (the chapter titles are types of shoes), and the ninja is forever a boy. If I had seen The Devil Wears Prada, I would probably compare it to that. But I will say that this is a book my sister would have loved and even though I’m a Transformer kid trying to play with a My Little Pony today, I’m going to do my best to tell you why Cinderella Smith is a great read, despite its unfortunate case of cooties. By the way, Cinderella Smith is the first book by Stephanie Barden, who will be here on Thursday to face the 7 Questions (assuming she doesn’t take offense that I said her book has cooties). And while I’m plugging, I might also remind you to check back on Saturday when we’ll have a surprise literary agent drop by to face the 7 Questions. Girls are mean, dude. Even as a little boy, I thought this, and my knowledge of little girls hasn’t increased much since then. Consider Cinderella Smith’s “friends,” the two Rosemary’s. They seem to feel they’ve outgrown Cinderella because they have pierced ears and Cinderella does not. They exclude her from their table at lunch (harsh). If you’re thinking those two Rosemary’s sound a bit like wicked stepsisters, you’re on the right track. Fortunately for Cinderella, there’s a new girl at school to be sat with and the two become friends. Her name’s Erin and she is about to get two for real stepsisters and she needs advice on how to determine if they’re wicked or not and who better to ask than someone named Cinderella? Cinderella doesn’t have any experience with stepsisters, but she has seen a lot of episodes of It’s Me or the Dog and read Dear Abby. Cinderella and Erin start a notebook of evidence about the two stepsisters so that Erin will know what to expect when she meets them for the first time. The friendship between Cinderella and Erin is one of my favorite things about this book. It feels natural and genuine and I completely bought it, but as I’ve mentioned, I have little experience in these matters. One of the great moments in the book comes when Erin and Cinderella are having a play date at Erin’s house and find several things about Erin that belong in their wicked stepsister evidence log. Could it be that the new stepsisters have as much to fear from Erin as she does from them? It’s perhaps not the dramatic revelation of Charlton Heston discovering that the Planet of the Apes (spoiler) is really earth, but it’s a mature thought and the girls arrive at it in a way that does not feel forced and which comes organically from the story. So what happens when Erin finally meets her new stepsisters? Are they wicked or what? Esteemed Reader, you know I would never spoil that for you. You’ll have to read Cinderella Smith to find out, and I recommend that you do. You’re going to have a good time and you’re going to laugh because parts of this book are very funny. And that’s my review, but I have three bits about craft. One, if you’re thinking of weaving a classic fairytale into your modern story, read Cinderella Smith. But please don’t weave the classic tale of Little Red Riding Hood into your vampire/werewolf/zombie/evil mermaid tale as we already have stacks of those (actually, the evil mermaid thing sounds promising). Readers will pick up on all of the elements in the classic Cinderella story in Cinderella Smith, but Barden doesn’t let them dictate the plot. There’s a big ball, disguised as a fall dance recital, and a bit about a lost shoe, and even a boy named Charlie Prince (how clever is that). But this isn’t a retread of Cinderella and that’s a smart move on Barden’s part. After all, if we want Cinderella, there’s a Disney version with talking mice and that’s going to be tough to top, although I always preferred Roald Dahl’s version in Revolting Rhymes. 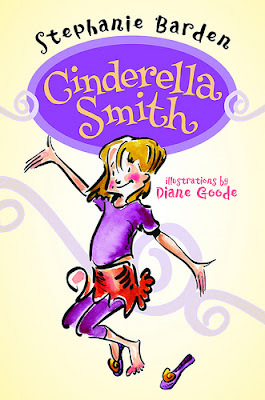 Cinderella Smith is a wholly original tale that uses the Cinderella motif more for laughs than anything else. Two, Barden makes a seemingly odd decision in casting Cinderella Smith as the protagonist. After all, her friend Erin is the one who is getting the stepsisters, Erin is the one whose mother is getting married, and it’s Erin’s mother’s wedding that makes for the climax of the third act. Isn’t this Erin’s story? Well, yes and no. Cinderella has a plot of her own, but it’s closely tied to the events in Erin’s life. The fact that the crux of the novel, the welcoming of new stepsisters, isn’t happening to our protagonist tells us something about her and creates a unique character. Cinderella Smith needs a friend now that the Rosemary’s have abandoned her and how intimately she involves herself in Erin’s affairs shows us the lengths she’s willing to go to for friendship. And besides that, Cinderella Smith is such a strong character with such a strong voice, it would be impossible to mistake anyone else for the main character. When we were very little, we called each other Tinder and Tarles because we couldn’t say each other’s name just right. As soon as I could, I started calling him Charlie, but he kept on calling me Tinder because he knows it embarrasses me, and this is why. Back when I was calling him Tarles, I had, for some dumb reason, a crush on him. In this instance I am allowed to use the word dumb because it’s about me and because it really was dumb. I used to walk over to his house every morning and ask him if he thought I looked pretty. If he said yes, I went back home and had breakfast. If he said no, I went home, changed my clothes, and tried again. And that is embarrassing stuff with a capital E.
Usually I would have loved to hear all about it, but my insides were hurting like the dickens, so much that I couldn’t pay attention. The lunchroom was noisy, but even though I was in the middle of a super crowded table and super crowded room, I felt alone. I chewed and tried to swallow and blink-blink-blinked my eyes. There was no way I was going to cry right then and there. No way with a capital N.
I don’t have a lot to say about these passages, except to point out the recurring motif with a capital ‘M’ (or ‘R’). Cinderella also uses the expression “like the dickens,” and a number of other expressions throughout the work, so that the language she uses to describe every situation is uniquely her own and could not be anyone else’s. More, all of Cinderella’s observations are tempered by who she is. In all thoughts, she takes into account what her parents think or have told her, which is completely appropriate for her age and situation. This is the world through the eyes of Cinderella Smith and if you struggle with voice the way I sometimes do, Esteemed Reader, here is a book for you to read. Or if you write voice perfectly (lucky) and you’re just looking for a good story well told, here is a book for you to read. She reached her hand right out the window, and I gave it a good shake, with a good grip, like my dad showed me. Nobody likes a limp-noodle hand. My mom’s eyebrow kept going up. Her eyebrow stayed half up and half down. I looked at my mom, but I couldn’t tell which way her eyebrow was going. This sounds cute! I think my niece (and me!) will really like it. This sounds too young for my library, but I'll look into it for some younger girls on my gift giving list! And I'm really looking forward to your revelation for the reasons behind your spectacular mood. But, since I know and respect your ninja skill and stealth, I know I will just have to wait. I am also thrilled to have a sense of the sort of great person who would respond so enthusiastically to the wonderful Cinderella Smith! Very best, Barbara Lalicki, the lucky editor of the book!